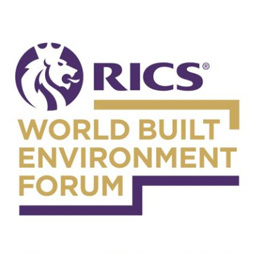 150m+ Buildings 273 Completed • 35 Under Constr. 300m+ Buildings 8 Completed • 11 Under Constr. 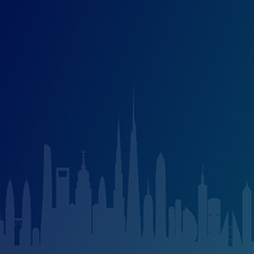 Join the CTBUH New York Chapter for a seminar on some of the key issues of seismic design of tall buildings, both in New York and around the world. 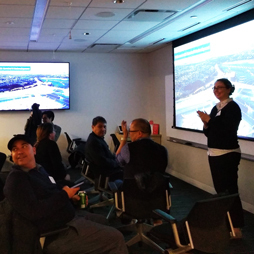 CTBUH New York Chapter hosted a presentation on LaGuardia Airport's new Terminal B, joined by speakers from the project's design teams. 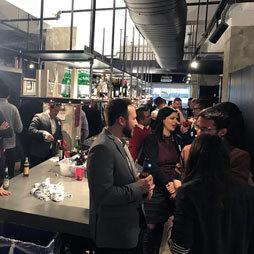 The CTBUH New York Chatper kicked off the holiday season with a fun, spirited party and celebration of a successful year. 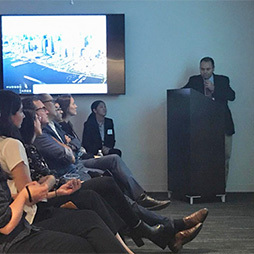 The CTBUH New York Future Leaders Committee hosted a discussion on strategies for healthcare resiliency, featuring architects, engineers, project managers and owners. 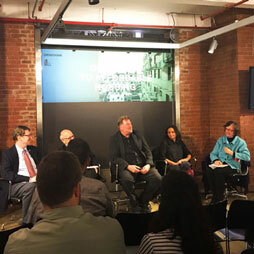 The CTBUH New York Future Leaders Committee hosted a panel discussion on "Obstacles to Affordable Housing" at the NYC Office of Grimshaw Architects. 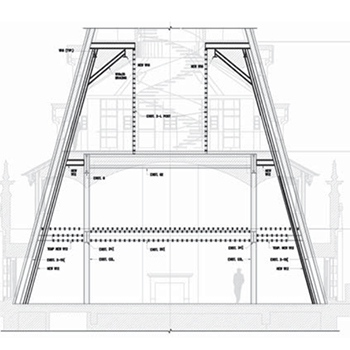 Debate: Were Engineers Better In 1818 Or 2018? 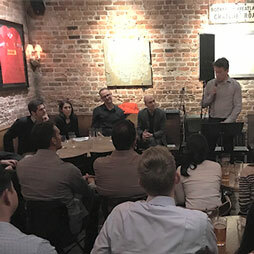 On September 21, 2018 at Arup’s NYC office, the Institution of Civil Engineers (ICE) partnered with co-sponsors CTBUH to host a friendly, spirited debate. 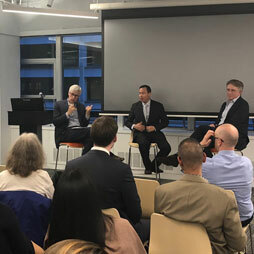 The CTBUH New York Chapter hosted a panel discussion on smart cities, the key systems that harvest data for planners, designers, policy makers and the general public. 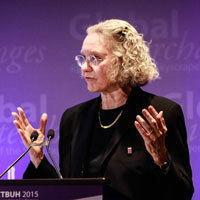 In the 2018 CTBUH Journal Issue III, Aine Brazil, Vice Chairman, Thornton Tomasetti, talks about her career highlights in high-rises and the support for more women in engineering. 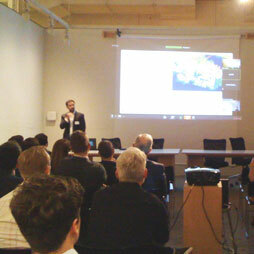 The CTBUH New York Chapter held an event focusing on how technology enables collaboration on international projects. 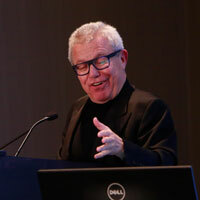 Speakers used case studies to highlight innovative solutions. CTBUH New York attended a tour of the ARO building, known for its avant-garde approach to maximizing space and providing direct outdoor access for its residents. 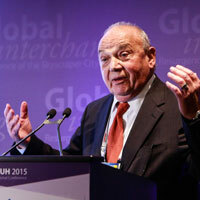 CTBUH New York Debates: Has New York Built Too Tall? 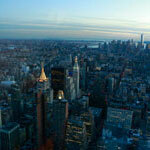 The New York "Future Leaders" Committee recently debated whether NYC has built too tall. 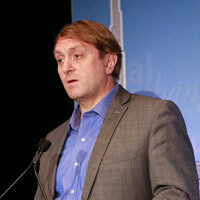 The two sides discussed current challenges to development as well as future considerations. 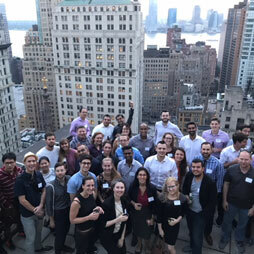 The CTBUH New York Young Professionals Committee (YPC) hosted a sold-out Summer Social, this year hosted by BuroHappold Engineering. 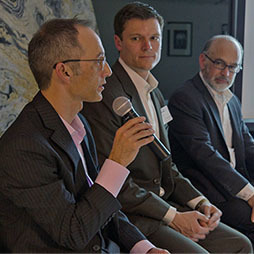 CTBUH New York held a presentation and panel discussion on the character and behavior of tall timber buildings, as well as the future opportunities with timber in New York and beyond. 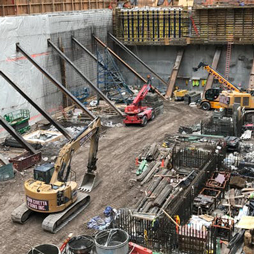 CTBUH New York hosted a series of presentations and a tour at the construction site of One Vanderbilt, which will rise to 427 meters when completed in 2021. 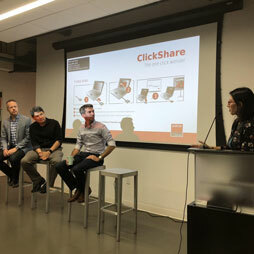 CTBUH NYC YPC Hosts "Cornell Tech The House & Passive House"
Join in a conversation discussing if zoning regulations created to tame towers during the rise of the skyscraper in the early 20th century have kept pace with today's evolving skyline. 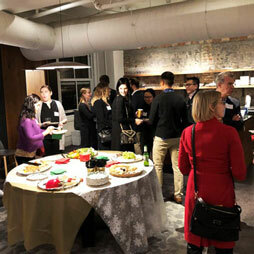 NYC Young Professional Committee members volunteered as panelists for Pratt Institute's year-end review, after working with the students throughout the semester. 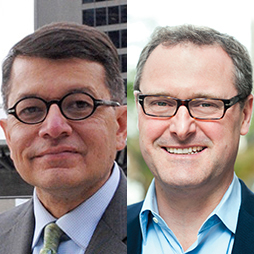 CTBUH HQ has announced the funding of grants for CTBUH New York, in association with the New York Young Professionals Committee (YPC) and CTBUH Australia. 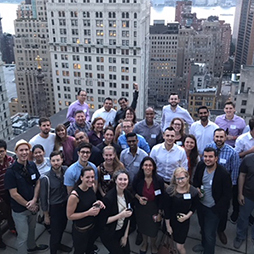 The Young Professionals Committee held their Summer Social event, hosted by FXFOWLE Architects in Manhattan, and met some of the people behind the 3 Hudson Boulevard development. 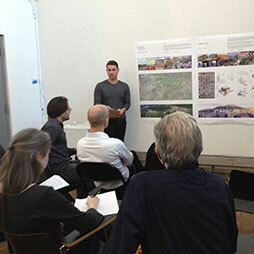 NYC Young Professional Committee members volunteer as panelists for Pratt Institute's year-end review, after working with the students throughout the semester. 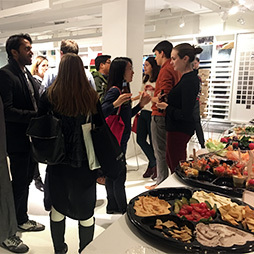 The CTBUH NYC Young Professionals Committee welcomed over 150 design professionals for ASPECT:RATIOS, a seminar focusing on female perspectives in architecture. 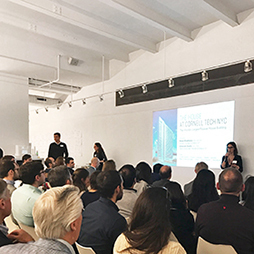 CTBUH YPC kicked off their educational outreach initiative with a mentorship program at Pratt Institute, to teach students how to unlock synergistic potential in their designs. 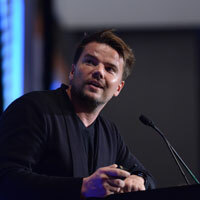 All technical papers and PowerPoint presentations from the CTBUH 2015 New York Conference are now available to view and download for free. 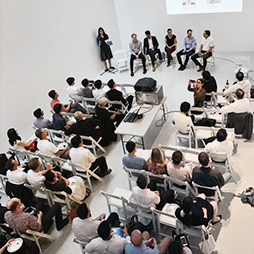 The biggest names impacting New York’s skyline come together to discuss the projects that now epitomize the city, the ever-evolving real estate market and what’s next for New York. 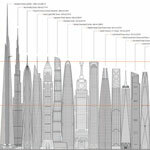 There are now officially 100 supertall (300-plus-meter) skyscrapers in the world following the completion of 432 Park Avenue in New York City. CTBUH 2015 delegates toured City Point Complex, Barclays Center, and 461 Dean Street which have impacted the cityscape of Brooklyn. CTBUH 2015 delegates toured High Line, which have significantly changed the urban landscape of New York City, from its history to its near-future. CTBUH 2015 delegates toured Woolworth Building which was the tallest building in the world at its completion in 1913. 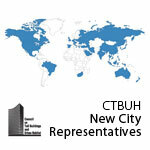 CTBUH 2015 delegates toured the United Nations Secretariat Building which the tour guided the group of visitors through some of the most exclusive and famous parts of the building. 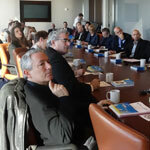 CTBUH 2015 delegates toured the Hudson Yards develoment which is the largest private real estate development in the history of the United States. CTBUH 2015 delegates toured the Rockefeller Center which the tour predominantly focused on discovering what happens “backstage” at one of the most famous tall building complexes. CTBUH 2015 delegates toured 4 Times Square and Bank of America Tower which are a fantastic look at two generations of towers that focus on sustainability and quality of environment. CTBUH 2015 delegates toured Fordham University's law school and residence hall which houses the law school in the first 10 floors and a residence hall in the top 12 floors. 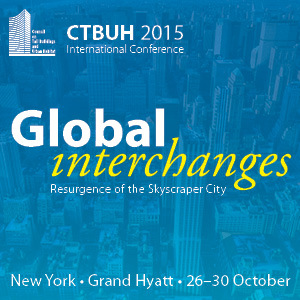 CTBUH 2015 delegates toured the Miles and Shirley Fiterman Hall which is the southernmost piece of the Borough of Manhattan Community College (BMCC) campus in lower Manhattan. 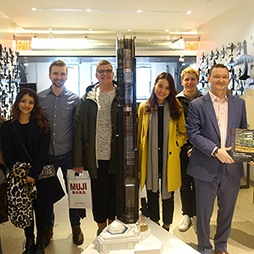 CTBUH 2015 delegates toured the infrastructure and underground of the World Trade Center complex which will house a variety of civic programs. 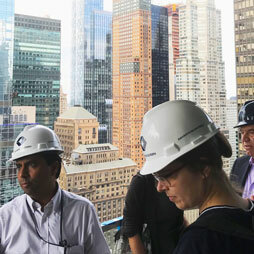 CTBUH 2015 delegates toured around the construction of 56 Leonard Street, which is set to be one of the top luxury residential towers in downtown Manhattan. CTBUH 2015 delegates toured the Empire State Building as the most iconic skyscraper and its retrofit into the today's environment-aware society. 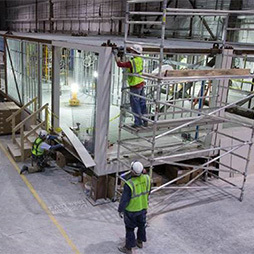 CTBUH 2015 delegates toured 461 Dean Street Factory which will be the World's tallest modular building containing 930 modules made up of 225 designs. CTBUH 2015 delegates toured 432 Park Avenue which will be the future tallest all-residential building in the World. 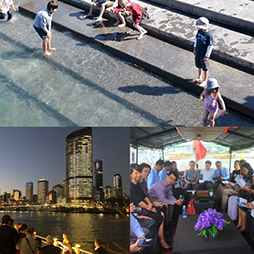 CTBUH 2015 delegates toured around the construction site of 50 West. 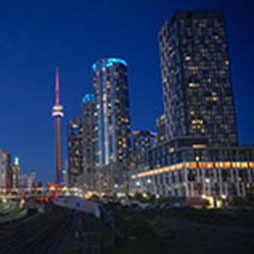 The tower is unique for its rounded corners and high-quality glazing, which provide a futurist aesthetic. Delegates from the CTBUH 2015 New York International Conference visited the 400 Park Avenue South building, which was completed in 2015. CTBUH 2015 delegates toured 7 Bryant Park Office Building which sits on a block-long site fronting on the Avenue of the Americas between 39th and 40th streets. CTBUH 2015 delegates toured around Brookfield Place Building, originally the World Financial Center. The building has been the home of many American corporations. 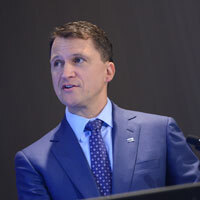 CTBUH Board of Trustees, Secretary Craig Gibbons give a CTBUH Leader's Message on 2015 International Conference in New York City. The Hudson Yards Networking Reception took place on Tuesday evening in the incredible Time Warner Center, offering great views of Columbus Circle at the corner of Central Park. 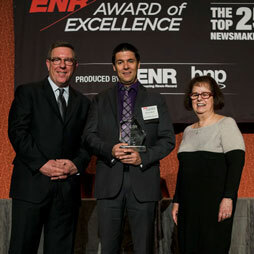 The reception provided attendees an opportunity to meet and network with their fellow delegates in the incredible setting of the 80th Floor of the historic Empire State Building. 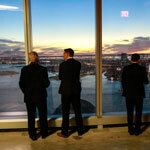 This special reception held on the eve of the Conference gave VIPs a unique opportunity to mingle in the fantastic setting of the new One World Trade Center. Presentations of the architectural and engineering design of 432 Park Avenue, the tallest residential building in the Western Hemisphere. The Young Professionals Committee New York met to discuss upcoming events, educational programs, and the mission of the group. 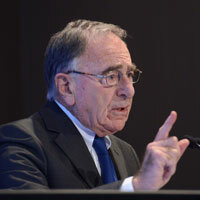 Uneven Growth seeks to challenge current assumptions about the relationships between formal and informal, bottom-up and top-down urban development and to address potential changes. TIMES SQUARE, 1984 examines the decisive moment and the resulting transformation of the “Crossroads of the World" into today's bright and crowded tourist mecca. 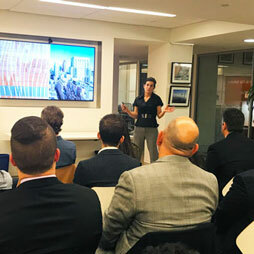 The first meeting of the CTBUH Young Professionals Committee (YPC) – New York City Chapter was held at the offices of Kohn Pedersen Fox. 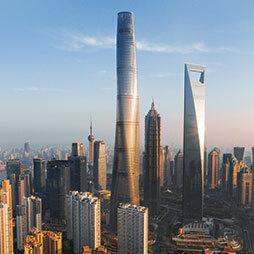 The 541-meter (1,776-foot) One World Trade Center has now become the world’s third-tallest building, according to the height criteria set by the CTBUH. 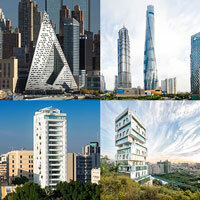 It seems increasingly evident that 2013 will be remembered as The Year of Prefab in the tall-building community. 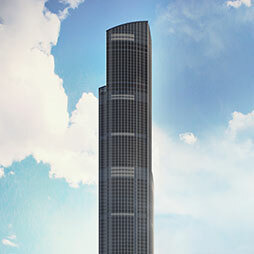 At 32 stories, B2 promises to become the tallest modular building. 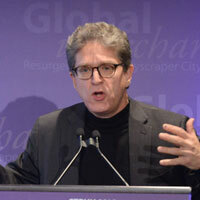 Eleven Times Square attempts to make a more sustainable model for an urban building. A crystalline architectural beacon along the shore of the Hudson River, 100 11th Avenue utilizes a multi-pane panelized façade system to impart its signature shimmer on Manhattan. The building addresses the adjacent High Line in a very successful way, rising from its ultra-compact site to create a very positive relationship with the elevated linear park. 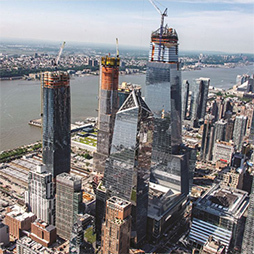 Part of the ambitious World Trade Center redevelopment, the 541-meter One World Trade Center (1WTC), designed by SOM, rises on the northwest corner of the Lower Manhattan site. The Bank of America Tower produces a high level of sustainability within the commercial market place, creating a strong identity for itself. 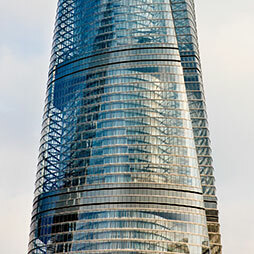 Attendees toured the Bank of America Tower, the recipient of the CTBUH Best Tall Building Americas Award in 2010. Located west of Columbus Circle across from Central Park, the Time Warner Center sits in one of the most strategic places in Manhattan. 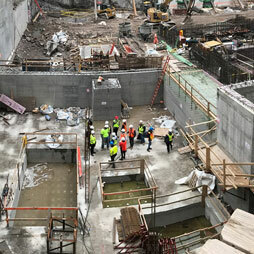 Almost ten years after the destruction of the twin towers, we can now see that the reconstruction of the World Trade Center site is in full swing. 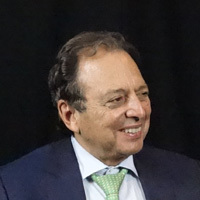 New York City’s latest addition to the downtown skyline is a 76-story tall residential tower which, as the name suggest, has been named after the architect. The New York Times Building is a 1.5-million-SF, 52-story building on Eighth Avenue in Manhattan, anchoring the west side of the redevelopment of Times Square. 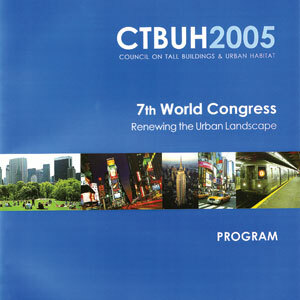 The CTBUH Comments on the “Structural Fire Response and Probable Collapse Sequence of World Trade Center Building 7 August 2007” Prepared and Issued by NIST. 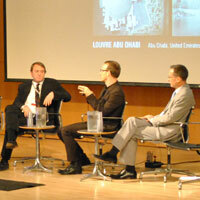 Renewing the Urban Landscape was set near one of America’s most complex and challenging rebuilding projects – the reconstruction of lower Manhattan. 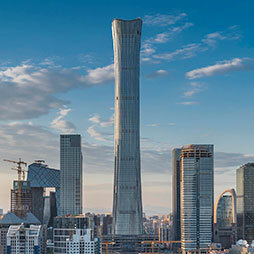 Maximizing capacity with smart and energy-efficient elevator solutions for the high-rise buildings of the world’s inaugural metropolitan century. 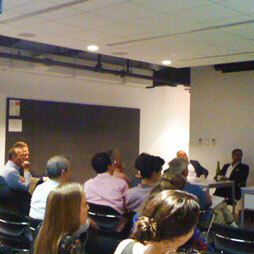 26 Oct 2015 – Global Interchanges: Resurgence of the Skyscraper City; Harry Macklowe, Macklowe Properties, Inc.
26 Oct 2015 – Global Interchanges: Resurgence of the Skyscraper City; Stanford Chan, John Hannum, William Logan & Marissa Vaish, Vidaris, Inc.
Debating Tall: Luxury Superslims: Bane or Boon? 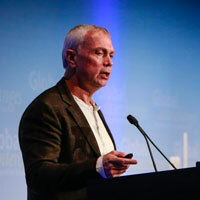 Jun 2014 – CTBUH Journal, 2014 Issue II; Neil Chambers, Chambers Design, Inc.
Jan 2010 – CTBUH Journal, 2010 Issue I; Todd Schliemann, Tara Leibenhaut-Tyre & Megan Miller, Polshek Partnership; et al. This paper argues mass transit is the key to urban development, urban renewal and sustainable cities with New York City as the case study.